Summary: The Bureau of Paranormal Investigations and Tracking is a government agency dedicated to capturing and studying paranormal objects and entities. Legal Status: The Bureau of Paranormal Investigations and Tracking is a branch of the Department of Homeland Security, an American federal agency. It occasionally exercises law-enforcement powers, but it primarily performs investigations and deals with areas where legal status is vague or simply irrelevant. Location: The Bureau of Paranormal Investigation and Tracking was founded in the late 1800's. Formerly an office within the U.S. Secret Service, construction of their headquarters in what is now South Titan began shortly thereafter, and the original building has been continuously refitted to accommodate the latest technology and discoveries. As a government organization, PIT also has access to such facilities as the Titan City Coast Guard launch pad, where they can land helicopters or other aircraft. However, PIT agents can be found in small numbers throughout Titan City, the United States, and even the rest of the world, following various leads related to the supernatural. Notable Members: Peter Jones (“The Commander”); Wendy Blakemore (“The Warden”); Elga Dingler (“The Inventor”); Normand Rants (“The Investigator”); Jean-Louis Marchand (“The Archivist”). These individuals lead various subdivisions of PIT. Other members of note include the ghostly Scooter (PNE-1439) and the slimy Joe Slick (a supernatural being). Stated Purpose/Goals/Motives: The Bureau is a public, governmental organization whose goal is to protect humanity from the paranormal and the inexplicable. PIT is equipped to investigate, and, if necessary, fight deadly paranormal phenomena of all sorts. It curtails threats before they become problems as well as putting a stop to dangerous unearthly phenomenon. PIT feels it is always better to preserve than to destroy. It places a high importance on studying, understanding and containing any objects and entities that can be considered dangerous as well as doing everything in its power to prevent them from falling into the wrong hands. Since its founding, PIT has tracked and captured paranormal anomalies in various locations around the United States. For the first several decades of its existence, PIT existed and operated in secret. 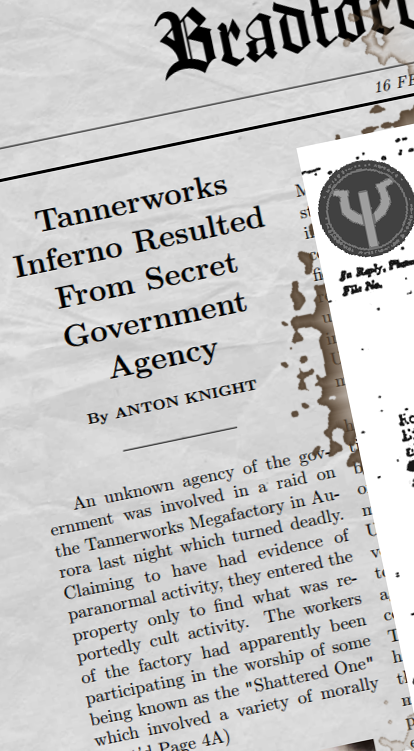 In 1889, PIT orchestrated a raid on the notorious TannerWorks MegaFactory in what is now NRD. Though PIT’s role in events was not revealed until years later, mysteries related to the long-destroyed factory and its contents continue unabated to this day, with PIT at the forefront of their investigation. In the following decades, as superpowered beings took the world by storm, the line between normal and paranormal began to blur. Shortly before World War II, the higher ranking officers of PIT made the decision to go public, as this new "acceptance" of the surreal by the general population convinced them that they no longer needed to work in secrecy. Since then, PIT has been active in the cleanup of paranormal events, capturing rogue scientists, tracking unearthly creatures, and retrieving a number of magical artifacts from assorted super-threats. Today, PIT continues its investigations into the supernatural, improbable, and otherworldly in a variety of areas. PIT personnel investigate the operations of a variety of alleged conspiratorial groups in Titan City, pursue its ghostly entities, including Begrudging Dead of Lotus Hills and the mysterious Ghost Train of South Titan, track down sightings of cryptozoological and mythic creatures ranging from sasquatches to zombies, and even tabulate reports of “giant monster” sightings. Combat Information: The majority of the members of the PIT are normal humans armed with advanced technology and trained in dealing with supernatural or unexplained threats. The PIT is a government funded organization with military weapons and training. Thus, while its agents rarely take the field in large numbers, they are a dangerous and capable force in open battle. In combat situations, PIT agents wear military-style uniforms that are utilitarian and designed for their specific combat roles. They carry weapons and armor that often present a strange combination of sleek modernity and jury-rigging. Outside of pitched combat, PIT operatives are generally rumpled, lab-coated scientists or besuited investigators whose appearance gives little hint of their esoteric knowledge. Tactically, PIT forces are well-organized and rely on a combination of elaborate planning and, often, traps. Some operatives are trained for melee combat, but most rely on advanced slug-throwing or energy-based weapons fired from range, with a strong emphasis on inflicting unconsciousness, disorientation, sensory deprivation, and other nonlethal but distracting effects.